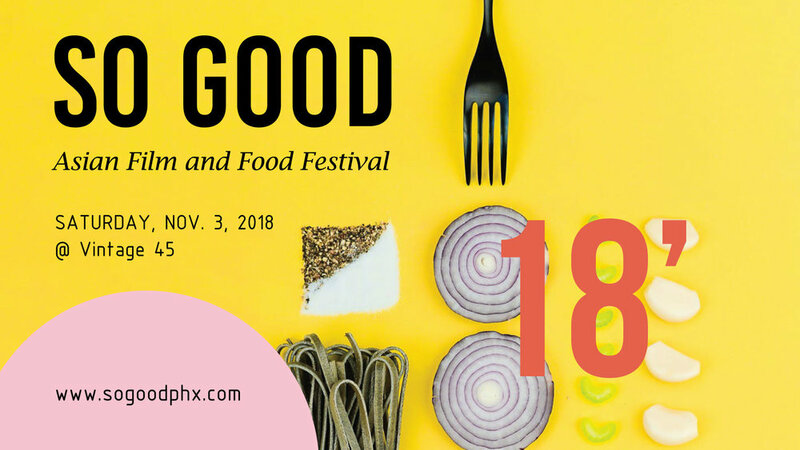 So Good Asian Film and Food Festival is a one-day celebration on Saturday, Nov. 3, 2018 at Vintage 45, dedicated to showcasing the talent of film and taste makers in the Asian community, while supporting a good cause. So Good will be hosting an open call for entries from film producers. The film’s principal producer, production company, or leading cast must be of Asian descent. Six finalists will be selected to feature their film at the event. Winner for best film and will be awarded $1,000, presented by the Arizona Asian Chamber of Commerce. Local influencers in the Asian community will present a discussion panel on the impact of the Asian community in the media and local economy. Films will be paired with street food style snacks prepared by local vendors from the PHX Night Market. Capping off the night will be a limited seating VIP ‘Crazy Good Dinner,’ a red-carpet feast inspired by the recent box office hit ‘Crazy Rich Asians,’ celebrating traditional and modern Asian cuisine, prepared by Chef Kevin Rosales of Good Fortune Kitchen and Chef Bob Tam of Bitter and Twisted. The event benefits PLAN (Phoenix Legal Action Network) to help raise funds for PLAN’s Justice for Immigrants and Families Project, which provides free legal services to families in our community at risk of deportation. LIMITED TICKETS TO GO ON SALE SEPT. 17 - STAY TUNED!